Today's the big day! 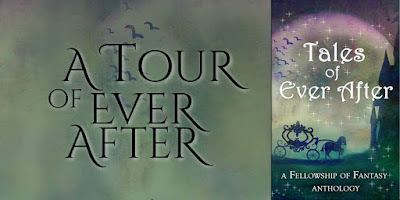 Tales of Ever After, a Fellowship of Fantasy anthology, has been released! It's available as an ebook and a print book on amazon and is available at several other stores through Books2Read. 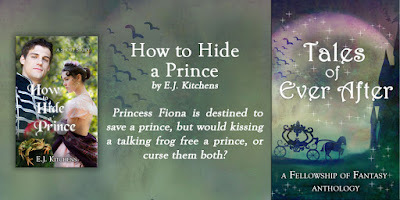 My contribution, the short story "How to Hide a Prince," is a Frog Prince retelling with a bit of a twist. It's a fun story and I'm excited to be able to share it with you. Here's a bit more about it and the anthology. Be sure to enter the blog tour giveaway through the links at the bottom of the post. 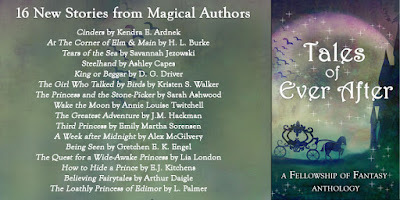 If you'd like to learn more about Tales of Ever After's authors, click the image above to go the blog tour schedule. She spends her days tossing a golden ball. Seriously? That was my reaction when I started reading the Grimm brothers' story “The Frog King.” It didn’t get better from there. There’s the mindless princess who soon becomes the selfish princess who doesn’t want to fulfill her end of the bargain with the talking frog who retrieves her golden ball from the water. Then there’s her father, the king, who hears a loud banging on the castle door and sees his daughter’s heart beating frantically and asks if there’s a giant come for her. And that fabled kiss? Not in the story. The frog is tossed against a wall. So the Grimm story wasn’t what I was expecting, but perhaps that’s part of the fun of fairy tales. They spark the imagination and invite us to contribute our own creations. We pull out the intriguing ideas--a prince cursed to be a frog and who must gain something from a princess, a world where a giant (or something else--like a dragon) might be at the door--and answer the challenge to create our own fairy tale. Like E.D. Baker did with her adorable story of a princess who kisses a frog and then becomes a one herself. Baker's The Frog Princess inspired Disney’s The Princess and the Frog. So there’s the classic frog prince story where a princess meets a frog in a garden, kisses him, and the frog becomes a prince; and the Baker/Disney version where the girl kisses the frog who claims to be a prince and is turned into a frog. The frog prince story revolves around the kiss and a curse. But when considering how to make my own version, I had to ask, what if the girl is prevented from kissing the frog? What if a man appears claiming she’ll be cursed if she kisses the frog? That the frog isn’t the kind of prince she thinks he is. What if the man and a sorcerer are both after this frog? If you were a princess, who would you believe--a frog with the power to speak or a man who’d sneaked into your castle and drew a sorcerer there? That’s Princess Fiona’s dilemma in “How to Hide a Prince.” If she makes the wrong choice, more than just she and the frog will suffer. It's a bit different from a girl mindless tossing a golden ball all day, when she's not tossing frogs against walls. Hopefully, you'll enjoy this rendition and its twists and surprise ending. Princess Fiona enjoys being a healer, but she doesn’t expect those gifts to have anything to do with the prophecy declaring she’ll save a prince. Or either to have anything to do with a frog who claims to be said prince. But now she finds herself shut away in her own castle, hiding from a sorcerer and looking after both a frog and a wounded young man who insists she’ll be cursed if she kisses the frog. Who’s she to believe? Enjoy "How to Hide a Prince" and fifteen other fairy tales in Tales of Ever After. Rescue a princess, meet a mermaid, win your reward. The authors of the Fellowship of Fantasy tackle fairy tales from once upon a time to happily ever after. Explore twists on old tales and brand new magical stories. Meet feisty mermaids, friendly lampposts, and heroes who just might be monsters themselves. This fourth anthology from the Fellowship of Fantasy will lead you on a quest for entertainment and storm the castle of your imagination. So make a wish and enter the deep dark woods to find stories that will make you laugh, shiver, and maybe even fall in love. Also, be sure to comment on all the blog posts in the blog tour this week. The person who comments the most times will win a small collection of sneak peeks from some of the authors upcoming works. To get you started, here are two questions you can answer for me. What's your favorite fairy tale and do you have a favorite Frog Prince retelling? Thanks, Jemma! The collection is available as a free ebook (or will be soon on amazon), if you like ebooks. I just love your story, Elizabeth, and it's fun to hear where the idea came from! You're right, the original frog prince fairy tale doesn't sound like a very endearing story. I enjoyed Disney's version, and Melanie Dickerson had a creative take on it in The Princess Spy. Congratulations on the new release! Thanks, Laurie! I had almost forgotten about Melanie Dickerson's version, but I enjoyed it too. hmm... I don't really know, honestly I'm not too familiar with Fairytales. But I read your story and it was one of the ones I enjoyed most! Thanks, Julia! I'm so glad you enjoyed it!